See your reef up close and in vivid color like never before! 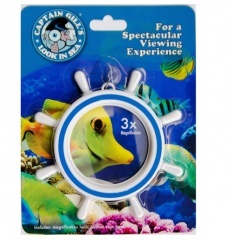 Since fish are naturally shy, it may take a little time before they have become familiar with the Captain Fill's Look in Sea. To help speed things up, try feeding your fish directly above. Even better, try training your fish by regarding them with a treat when the swim into view. *The Captain Gill's Look in Sea may aid in the earlier detection of some tropical fish disease.